All Saints is one of East Suffolk's more memorable sights, like a castle on a hill above the approach road to Orford. It is as close to that fascinating little town as it is to its own village, and before the tower of St Bartholomew was rebuilt, it was easily mistaken for Orford's own. It appears grander than it actually is. The graveyard is a delight, walled and sloping rapidly to the west, like a clearing in the wilderness. Some summers it is surrounded by free-range pigs, but coming back this way in 2008 I found the fields fallow, making the setting even more peaceful. Beyond the church, to the north, the narrow lanes wend through the forests and marshes to Iken and the drama of the River Alde. All Saints was almost entirely rebuilt in 1878 by William Barnes, and because of this is often passed over by those in search of a more authentic medieval experience.This is a pity, for there are a number of surviving details from its pre-Reformation Catholic past that are fascinating, and the church itself is an excellent example of quality Victorian restoration. The church was closed for a year, and it must have been quite a surprise for the parishioners when they went back inside. Little expense was spared; the patron was Sir Richard Wallace of Sudbourne Hall, a regular employer of Barnes's services, and a name we will come back to in a moment. Barnes built the transepts, restored the tower, reroofed the nave and chancel. I assume that the needle spire was also renewed at this time. But the doorways were retained, and they are fascinating. Firstly, there is a fine norman doorway in the south wall. This was discovered at the time of the restoration, but it wasn't pressed back into service. Arthur Mee claims to have entered the church through it in the 1930s, which seems a little unlikely. Looking at the carving of it, you can't help but be reminded of similar work at the nearby castle, and also at St Bartholomew. The south porch is now blocked, and you enter through the north one. Both have a pair of shields in the spandrels, one of passion symbols, the other of the Holy Trinity. The Trinity symbol is to the east in both cases. The church is open to strangers and pilgrims every day. You step inside to a well-groomed interior, polished wood and tiles a counterpoint to the imposing font. At the time of the 1878 restoration, the interior was completely refurbished, with new benches and Minton tiles throughout. It can seem rather dark inside, although not, I think, gloomy; one imagines easily the late 19th century ritualist services that must have taken place here. 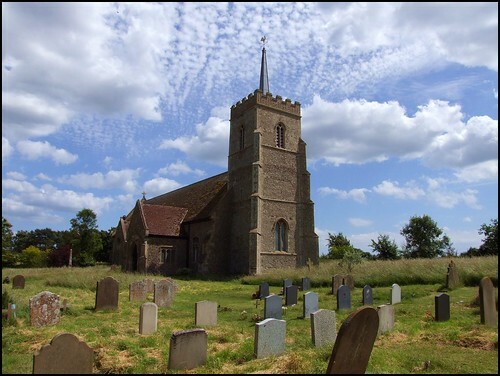 Sam Mortlock observes that the church is more like that of a prosperous Victorian suburb than of a remote East Anglian parish. Two grand hatchments hang at the west end, a worthy frame for the tall tower arch and Norman font in front. They are to the Devereaux family, the Marquises of Hereford. One of their number left a considerable art collection to the Sir Richard Wallace, which he in turn bequeathed to the state - today, it is known as the Wallace Collection. Wallace also donated the organ here, in memory of his ancestors. The font is like a ripe cheese - the base is clearly modern, and lMortlock says that the shafts are, too. Wallace's organ is set into the north transept, which was obviously built for the purpose. The south transept is built as a family pew, presumably for the Wallaces, or Herefords, or Devereaux, or whatever they were calling themselves at the time. Up in the sanctuary is one of the grandest monuments you'll find round these parts. It is to Sir Michael Stanhope, who died in 1621. The inscription tells us that he sat at the feet of Elizabeth I for twenty years - let's hope it was a well-carpeted floor. In fact, he was Privy Councillor, both to her and to James I. Now he kneels through all eternity in Sudbourne church. Below him is his wife all in black, and their daughters to front and back. They have been reduced to stumps, and she has lost her hands. Whether this is due to the anger of Puritans at their royal connections, or simple carelessness over the years, I don't know. The monument is vast, taking up most of the north chancel wall, and looks a little out of place here, among the Tractarian furnishings, as if it were on an exotic holiday from Hawstead or Hengrave. Personally, I would have thought that there is a good case for his wife, at least, to be restored - perhaps the Wallace Collection could help fund it. I stepped outside into brilliant sunshine; the open graveyard is edged by simple modern cottages, what looked like an old Rectory, and the brooding forest off to the north. To the east and north of the church, the graveyard is lush and verdant, the 18th and 19th century graves huddled in their greenery. One just to the south of the chancel has a splendid inscription. It is to Matthew Groom, who departed this life in 1769, at the age of 49. It reads in part: The Boreas Blasts Neptunes Waves have tost me to and fro. Yet spite of both by God decreed I Harbour here below, Where I do now my Anchor lay with many of our Fleet. Yet once again I must set Sail our Admiral Christ to meet. It seemed a suitable epitaph to find here, just two miles from the sea, and yet in a wholly agricultural setting; how often this land must have sent its sons off to watery graves! More splendid, although less sentimental, is that to Jane Elizabeth, the beloved wife of William Cobbett, who died in 1871. This clasical needle, surrounded by iron railings, makes quite a statement among its humble companions. Best of all I liked a far more recent memorial to Patricia A J Finbow RGN. The inscription reads simply A Matriarch.